Fire Emblem Awakening was by far my favorite Fire Emblem game ever released. It set the bar high, reinvigorating the series as well as attracting many new fans. So when I heard that Fates was coming out, I was both excited and apprehensive. 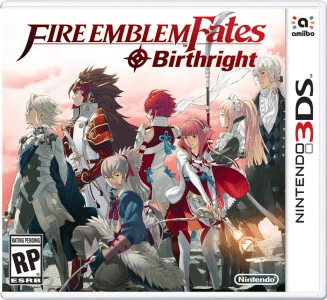 Sure, I wanted more Fire Emblem goodness, but could this game possibly prove itself better than Awakening? That seemed an insurmountable goal, but I was willing to give it a chance. When I heard that Fates was split between two versions, akin to Pokemon, I was confused, but also excited. This was a new approach for the series, and if it worked, the novelty could easily make this a contender. With that in mind, I decided to sit down and review Birthright, the “easy” version of the game dedicated to restoring peace under the auspices of the Hoshido empire. Did Birthright convince me that it was better than Awakening, or did it lose the faith that Awakening restored in me? Birthright starts with Corrin waking from a fitful sleep and a dream of being torn between Hoshido and Nohr. 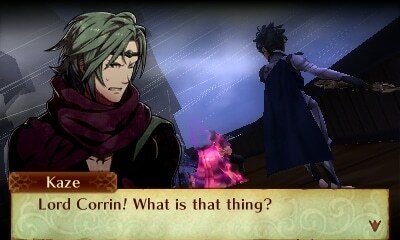 Which is crazy, since he’s a prince of Nohr. Or at least, that’s what he’s been led to believe. He quickly learns that things are not as cut and dry as he imagined, and that he was kidnapped from Hoshido at a tender young age by his “father”, King Garon. 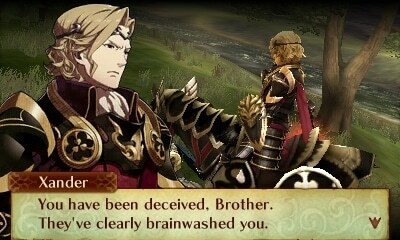 These revelations come suddenly and at a steep cost, but they don’t change the feelings he has towards his Nohrian siblings – Xander, Camilla, Leo and Elise. Since they are from Nohr, it’s easy to mistake them as the “evil” royals, but in truth, they are more complex individuals than you might expect. Nohr is a kingdom of darkness, pride and stern power, but its people still kindle a spark of goodness in their hearts. Of course, finding that takes some effort, and once Corrin sides with Hoshido, he sees how truly scary his Nohrian siblings can be when they vow to get him back, no matter the cost. I can’t speak much more about the story without spoiling things, but suffice to say, Nohr escalates the cold war between them and Hoshido, and it’s Corrin’s job to end the bitter war and bring peace to the land once more. With him are the Hoshido royalty, his true family. 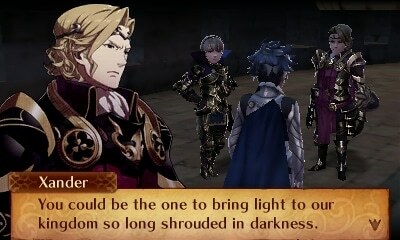 While Nohr represents the dark side, Hoshido represents the light. The Hoshidans are wise, compassionate and determined. They will fight for what is right, not merely for the joy of conquest. 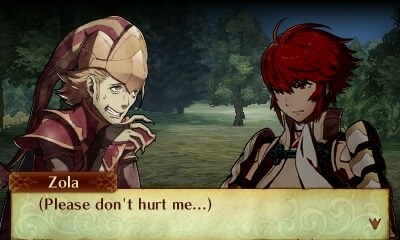 Representing your Hoshidan family is Ryoma, the stern yet powerful older brother; Hinoka, the tomboyish Pegasus Knight; Sakura, the sweet and demure princess, and Takumi, a brash and arrogant archer (gee, where have I seen that before?). There is actually another person who represents Hoshidan royalty, and her name is Azura. She is an incredibly mysterious character. Apparently, she was kidnapped around the same time that Corrin was, but from Nohr. She then spent many years growing up in the idyllic nation of Hoshido, learning to love the people and culture. She is also a Songstress, a class akin to Dancers from previous games in the series. Typically this isn’t a class represented by a major character, but Azura seems to be integral to the secrets at the heart of the game. I’ll touch more upon her later. For now, let’s discuss what any Fire Emblem fan comes to see – the combat! 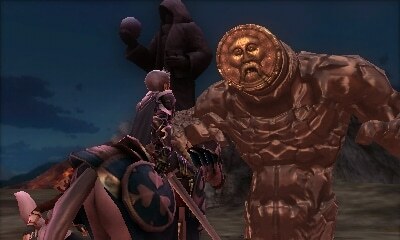 For those who loved the combat in Awakening, rest assured it’s just as good in Fates. You still marshal your forces on maps, moving each unit to defeat enemy forces. One noteworthy improvement was with the complexity of the battle animations. In Awakening, a simple slash often represented a critical hit, but now complex dual or triple strike animations are in place. They have also made it so the camera dynamically pans during battle, which was pretty cool, and only once resulted in hitting an invisible wall. While it’s true that Birthright represents the easier experience, it would be foolhardy to call it a pushover. I played the game on Normal Classic, and had to retry maps multiple times to beat them without losing anybody. Even then, I still ended up losing a handful of units by the time I beat the game, despite my best attempts to avoid permadeath. This is because the gameplay is still very complex and challenging, and you’ll need a lot of strategy to get by unscathed. The Weapons Triangle is still in effect, though they have modified it somewhat. The old triangle consisted of Swords, Axes, and Lances but they have added Tomes, Bows and Katanas to the mix. Better yet, many new weapons can negatively affect enemy stats, weakening them temporarily. However, I admit I often forgot what Katanas were strong and weak against, and would occasionally blunder into a bad situation. Luckily, you can pull up a guide at any time to help you remember how the additional weapons fit into the scheme of things. Besides modifying the Weapons Triangle, they have also made it so most weapons don’t break like in previous outings. I admit I was very concerned about this change when I first heard about it, worried it would make the game too easy. Luckily, not every item is unbreakable. Healing items like Vulnaries are still disposable, as are healing Rods, stat modifying Scrolls and Seals. Speaking of which, they have taken away the overpowered Second Seal introduced in Awakening, so you can no longer reclass a unit into a godlike powerhouse. Instead, you have new seals such as Friendship, Heart and Offspring Seals. These all allow you to change your class based off various factors, such as a character’s relationship with another character, and offers great justification to really max out your Supports with all of your units. They also have toned down how Pair Units work. If you are paired with somebody else, they will boost your stats, but not do any attacking. If they are positioned right next to each other, they will lend an attack, however. This is much more balanced than in Awakening. Now that I’ve established the combat is still great, I need to touch upon the classes in the game. One unique hook for Fates is that the classes are split between Hoshido and Nohr. While many of the classes you’ll be familiar with from previous outings are found in Nohr, such as Cavaliers, Knights and Dark Mages, those in Hoshido are very new and different. While some are essentially reskins of classic classes, such as Ninjas, which are basically Thieves armed with Katanas, many others are completely new. My favorite new class bar none is the Kinshi Knight, a giant bird riding archer who murders other aerial units and has great skills. Another thing I noticed about Hoshidan units is that, in general, they have lower DEF but higher RES. Luckily, you will come across Nohrian units you can recruit, such as Silas, and thus will have access to some of those classic units. I was especially thankful for my one Cavalier, as he was my only real DEF tank in my playthrough, while many of my others could be murdered in a couple of solid hits from a Sword, Axe or Lance, yet could laugh in the face of a magical onslaught. Another minor oddity I noticed was that the attack percentage often was not indicative of whether or not you would be hit. 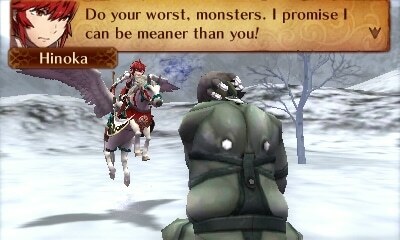 A painful example of this was when I sent Ryoma, a nigh unkillable uber unit, off to guard one corner of the map, and he was swarmed by low accuracy axe wielders and killed by a 20% accuracy attack. On the plus side, this did remind me of the addictive difficulty of Fire Emblems of yore, so it wasn’t all bad.